And, seemingly out of nowhere, Arrow gets political. Oliver has been in the mayor’s office for nearly a year, yet “Spectre Of The Gun” is the first episode to use that position to place Team Arrow right in the middle of a hot-button debate. In doing so, the show at last embraces the biggest missing piece of Green Arrow’s comic book legacy, at least the one that doesn’t require Stephen Amell to grow a goatee he’s reportedly sworn off ever getting. Portrayals always vary, but the canonical Oliver Queen of the comics is an outspoken lefty agitator of the first order, and for the show to present this Mayor Queen as an essentially apolitical, well-meaning public servant is to miss the whole point of why the Green Arrow bothered to become mayor of Star City in the first place. Tonight’s episode addresses that previous elision, with series creator Marc Guggenheim penning a story about a mass shooting and the gun violence debate. Let’s not kid ourselves here: Tonight’s episode is ham-fisted and unsubtle and generally basic in its arguments. It sets up obvious sides to the issue, with Curtis and Lance arguing for fewer guns while Rene and Dinah make the case for their efficacy, all while Felicity tries to shut out the debate and Oliver navigates the middle. Indeed, this isn’t the episode where Oliver reveals he’s been listening to A People’s History Of The United States on audiobook or working through some Marxist explainer playlists on YouTube—I’m not sure any of us can fathom just how milquetoast that final set of compromise ordinances he and the councilwoman put forward are. Oliver is implicitly positioned as the Democrat in his office debate, what with him apparently being for free speech and abortion rights but against gun rights, but that’s about it for anyone hoping for Oliver the lefty firebrand to show up. If anyone is filling that role, I guess it’s Curtis, but Arrow appears uncertain how much he should have actual, coherent opinions informed by his background and his experiences, and how much he should just sort of be the avatar for the strawman anti-gun argument. As Curtis mentions at one point, the fact that he’s black already makes him three times likelier to be the victim of gun violence, and the fact that he’s gay surely informs his perspective in a world where, among other things, the mass shooting at the Pulse nightclub in Orlando happened last year. Just to be clear: Arrow didn’t do anything wrong by not mentioning something as big and horrible and tragic as the Pulse shooting, and I suppose it’s conceivable that that particular event didn’t even happen in the Arrowverse. My point is more that Arrow is uncertain at what level it wants to pitch this debate. Is this going to be about a bunch of private citizens who all just happen to share a vigilante hobby chewing the fat over gun violence, all informed by their prior experiences? Is this going to be the team really, seriously grappling with what it means to be crime-fighters when discussing their views on guns? Or is all this going to be a glorified freshman dorm debate? Mostly, “Spectre Of The Gun” comes across as the third option, with Rene’s flashback experiences with guns and his wife’s death treated as a dose of cold, hard reality in the face of a lot of abstract arguments. And really, that approach is fine. If Arrow feels like getting political, I welcome the move, and I accept that such uncharted territory will have its clumsiness. This is a rare instance where Arrow lags behind its sibling Legends Of Tomorrow, which has used the time travel premise to get into lots of debates about racism and sexism. 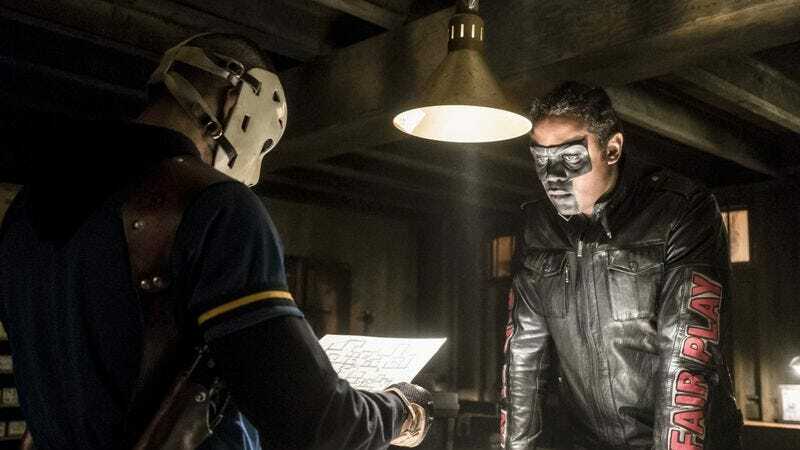 No show as grim and gritty as Arrow can claim it’s pure escapism with a straight face, so why not take the plunge into discussing current events? And whatever the limits of its debating prowess, the episode does get one thing absolutely right: Whatever solutions are to be found here can’t come from the Green Arrow. They must come from Oliver Queen, the mayor of Starling City. 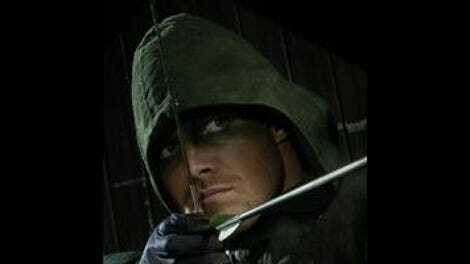 At a certain point tonight, Oliver just hangs up his cowl and sees this one through as a civilian, implicitly telling us that this is a “real” problem and that it would be facile to suggest such an issue could ever be solved with some dude firing arrows. And yeah, there’s plenty of room to take issue with the distinction this episode makes between a political issue like gun violence and a “normal,” story-driving issue like organized crime or the proliferation of drugs. There’s room to find reductive some of the points Guggenheim makes in his script, like when Curtis and Felicity lament that nobody ever talks about anything anymore and wonders if that’s what’s wrong with the country. There’s room to wonder just what point the episode thinks it’s making about guns with the Rene flashbacks, though at least on that point I’m pretty sure that’s intentional. But I’ll say this: If every Arrow episode from now on were as political as tonight’s and of roughly the same quality, then damn, that sounds terrible. But if this is just a first effort, a fumbling initial attempt to figure out how a generally apolitical show like Arrow can engage with real-world issues, and that the show is going to get more sophisticated in its argumentation from here, then that’s something worth encouraging. Honestly, I suspect this is mostly just an aberration, but if this stands as the one great, explicit justification for going to the trouble of making Oliver mayor on the show, then I’d say the episode has done its job. The rest of “Spectre Of The Gun” is standard-issue, solid Arrow fare. Dinah Drake is still yet to really make the transition away from underwritten new teammate, as her subplot with Diggle is too paint-by-numbers to register, but the fact that she’s rejoining the police is an intriguing move for her. Thea is back in the mayor’s office and generally vomiting all over Oliver’s relationship with Susan Williams, because Thea remains the best. Rory is indeed out of the picture for the time being, which is generally a shame and specifically one in the case of this debate-driven episode, considering he’s probably the team’s most thoughtful member. Vigilante shows up once more in the wake of Adrian Chase’s near-fatal injury, and I’m now officially leaning toward this whole thing being a massive misdirect and Vigilante being somebody else. (Which means it’s definitely Chase, because I’m always wrong once I start predicting things.) Just generally, Arrow has righted the ship enough that we can take the show’s basic, underlying quality as a given, freeing the show up to do something more experimental. Getting proudly, blatantly political certain qualifies, and even if the execution doesn’t quite live up to the boldness of the goal, that’s fine, as just being willing to engage with current events is its own achievement. It says a lot about how crazy the world has gotten and how fast things are moving that an episode all about mass shootings and gun violence almost feels… out of date? But, no, seriously, even if each week at the moment feels like a year’s worth of crap, the last major mass shooting—the attack on the mosque in Quebec by a white supremacist—happened fewer than three weeks ago. So while other political issues might have moved to the forefront—I look forward to Star City deciding whether it’s going to a sanctuary city in a few months—this is still completely, absolutely relevant, much as we might wish otherwise. I know I’ve said this before, but it’s staggering how dumb Oliver is being about Susan Williams. Thea is generally right about most things, but she’s super mega ultra right about this one.